If I were to utter the words â€œCanadian Literatureâ€ in your presence, what would spring to your mind? Of course the question is only relevant for those of you who did not run screaming from the room or nod off into a deep coma at the sound of that phrase. But for those of you handcuffed to your chairs and otherwise unable to escape my voice, what is conjured up by those two simple words? It is not a quantum leap in logic for you to think immediately of books. They might take some of you back to your high school English class, in a good way, or a bad way I suppose, depending on the curriculum of your day. Some of you may have come to CanLit later in life when the prospect of writing an essay was safely behind you. But whatever your own experience with CanLit might be, how could you not think of books when you hear the words Canadian Literature? It seems a reasonable response. But I wonder if any of you thought first of some of the striking settings in CanLit. Canadian Literature is not just about words on a page. Itâ€™s also about places on a map, our map. When you live and read in a country as vast, diverse, even wild as ours, a sense of place is almost always important to the story. When you live and write in Canada, the land, the city, the town, the lakes, the rivers, the mountains, the prairies, the forests, the coasts, and every setting captured in between, shape our storytelling. How could they not? Canadian readers and writers are creatures of our country, of our surroundings, of our place. We celebrate Canadian Literature in many different ways. We buy books. We stock our libraries with them. We read them, rave about them, and pass them on. We hand out awards for them. Sometimes we even turn them into movies, TV shows, or plays. But wait, thereâ€™s more. Project Bookmark has given us a new way to experience CanLit. Bookmarks have been around for centuries. They help us find our place in the stories we read. 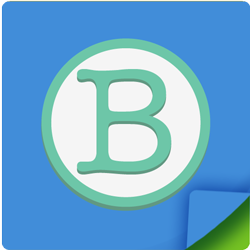 Well, Project Bookmark also helps us find the places in the stories we read. In fact, it commemorates important landmarks and locations in Canadian Literature with fancy, inspiring, prose-filled plaques. What a wonderful and very tangible way to honour the Canadian stories we love and where they take us. But these plaques havenâ€™t written themselves and then magically sprouted at a dozen locations across the country to date. It takes what so many Canadian writers struggle to find (no, not an agent or publisher, but thatâ€™s true, too), money. And there it is. Money. And here comes the pitch. 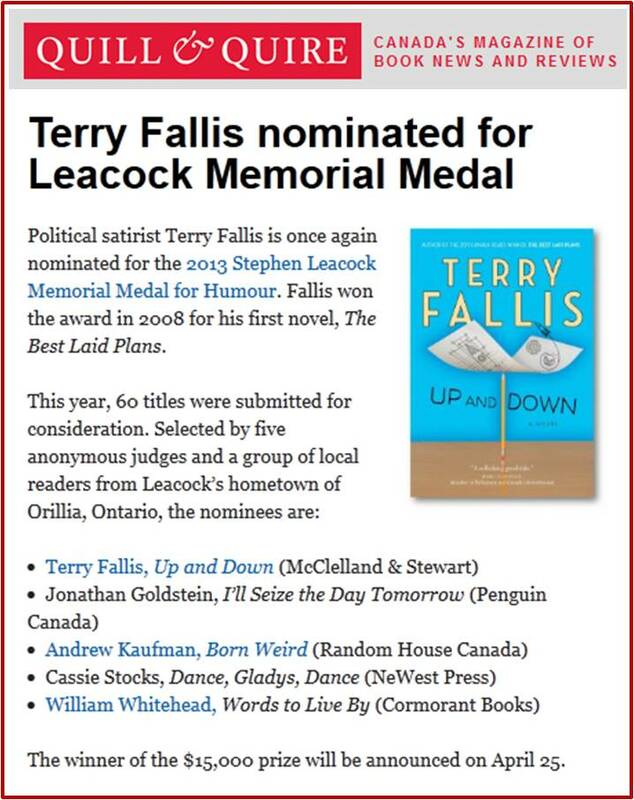 I’m still catching my breath from the news today that Up and Down has been named a finalist for the 2013 Stephen Leacock Medal for Humour. What a thrill to be amongst such talented and funny writers as Jonathon Goldstein, Andrew Kaufman, Cassie Stocks and William Whitehead. Some of you may already know how I feel about the Leacock Medal because it comes up quite often when I talk about my writing life. But for those of you who may not know, I have always felt that I became a writer on April 30, 2008 when my name was miraculously produced as the winner of the 2008 Leacock Medal. My life as a writer turned on that moment. Now, with Up and Down joining my first two novels as Leacock Medal finalists, well, I’m just so honoured and filled with gratitude. It’s as simple as that.